In a setting where at other times grand operas, operettas, musicals or ballet productions usually mesmerize the audience, the most dazzling parquet floor of the ball season is set to be taken over by a host of enthusiastic ball devotees in the social highlight of the year on 26 January 2019. This is where the worlds of business and politics, culture and science, media and society converge in the course of one utterly memorable night. 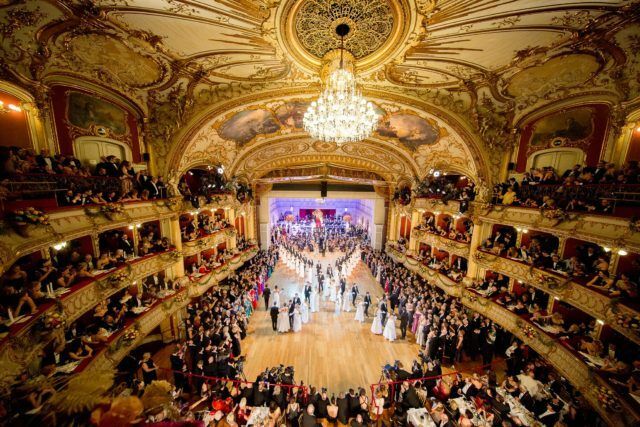 Over the past 20 years, the Graz Opera Ball has established a reputation far beyond the borders of Styria’s capital and has become a genuine crowd puller. A perfect blend of beautiful and architecturally unique interiors, excellent artistic support programmes, first-class culinary offerings, celebrity guests from the worlds of culture, business & politics as well as a healthy portion of relaxed conviviality and unbridled dance-loving cheerfulness makes this special ball a unique event throughout Austria. This is the one night of the year when the magnificent auditorium of the Graz Opera House merges with the stage and is transformed into perhaps the most beautiful ballroom in the world. Numerous rooms and spaces, also behind the scenes, are converted for this purpose into unique, magical worlds. The conférencier of the 21st Graz Opera Ball is Christoph Wagner-Trenkwitz. With his charm and distinctive, ingenious wit, Austria’s most charming connoisseur of the “Musical Theatre Universe” will accompany the audience through the most beautiful ball night of the season. Where else you can you dance in just one night to the sounds of the Graz Philharmonic in this magnificent ballroom, make your culinary dreams come true in 1001 oases, chill out in a fashionable beach club atmosphere, immerse yourself in a stunning cocktail jungle, experience sparkling opera moments in the Champagne Bar, dance behind the scenes to chansons and swing, groove to disco beats in the opera house cellar or simply sample the best culinary offerings of the delicious capital of Graz and the most exquisite wines of Styria on a culinary highway? These and many other, exceptional highlights await you during the 21st edition of the Graz Opera Ball in the sumptuous setting of the Graz Opera House on 26 January 2019. What’s more, since 2018 the Graz Opera Ball has been Austria’s first major ball to be held as an officially certified Green Event. In recognition of this, the Graz Opera Ball was awarded the special jury prize for “Pioneering Work in Austrian High Culture” by the Federal Ministry of Sustainability and Tourism at the “Sustainable Benefits” competition in July 2018. Previous articleNew looks on top … or where are the bees?